Also, I learned that when you want to add a touch of peppermint to your coffee, you should use a single drop of peppermint extract or. 00003 drops of peppermint oil. Basically, don’t use peppermint oil in your coffee unless you want to feel like you just sucked an entire candy cane up your nose. My sinuses still feel fresh. When somebody mentions Christmas videos, most of us think about full length films, but this one is special. This version of White Christmas has almost become a tradition of its own in our house. I don’t care a bit for snow at Christmas. I’d rather be wearing sunglasses and a pair of shorts, but I can’t hear this song without seeing Santa’s skinny little pipe-cleaner legs sticking out from under his Santa suit, and I laugh every time I hear the reindeer solo on the radio. Looking for more serious, thoughtful recommendations? Deep Roots At Home has a list of five worthwhile Christmas films. What are your favorite Christmas videos? Also, this is not specific to Christmas, but it’s certainly related. I just wanted to share it because I love it. It is posted on the inside of my front door. I really love that the panels on the door form the shape of a cross in the photo. I didn’t plan that, but Somebody did. Every time I leave the house (or come down the stairs, or cross from the dining room to the living room), these words serve as a reminder to us that we are servants of the Most High. My dad always used to remind us that when we are in public, we are like ambassadors for the Lord. If people peg us as Christians – and they should! – our actions and behavior affect how they think of God. We need to be a good witness for Him everywhere we go. Today was another busy day, with a lot of coming and going in many different directions. The morning swept by so quickly I only remember one accomplishment: we read two chapters in Luke, bringing us up to chapter 10, just where we should be. I’m still pleasantly surprised at how engaged the younger ones are in this process, taking it in as though they’ve never really heard it before. They really wanted to hear that second chapter, objecting when I suggested maybe we should do it later in the day. I think doing this at Christmas time while we look forward to celebrating the birth of Jesus makes a difference. It seems to bring home the reality of what we are reading – not just a narrative from long ago, but the real earthly life of Jesus. I also managed to trim the trunk of the Christmas tree with the circular saw. Not the ideal tool, I know, but it got the job done. As soon as it was done, Natalie and Becca hauled the tree into the house and we tried to set it up. Since we’re helpless wimminfolk, we couldn’t make the stupid thing stand upright. We had to lean it in a corner and wait for Perry to come home and fix it. I was afraid the trunk was too small for our base, and Perry agreed – until he took a closer look. He had a good laugh over this, since the problem was pretty obvious: I had neglected to trim the lower branches, so the tree wasn’t seated firmly in the base. It dangled and swung freely from the points where the four screws hit it. Once he fixed that little problem, we realized there was a second problem: the trunk really was too small to be held firmly by the base we had. Now it was my turn to laugh, but I held my peace in quiet dignity. Then he mentioned that IF ONLY SOMEBODY HADN’T THROWN AWAY THE DOOR SHIMS, WE COULD USE THOSE TO MAKE IT FIT. Yes, it was me. I threw them away. I threw away perfectly good little 10 cent scraps of wood. See why my house is a mess? One of us is an aspiring hoarder, and it’s not me. If he had his way, we would be buried in an avalanche of DVDs, blankets, hand tools, and paperwork. One of us is an aspiring minimalist, and it’s not Perry or any of his offspring. That’s not to say I am a minimalist, because if I were, he and the kids would bury me in a shallow grave somewhere. I just aspire, then go with the flow. No, one look at our house and you’ll know we’re not minimalists. We have more books, children and loveseats than any sane person I know, and the Christmas explosion is growing day by day. Today we were the happy recipients of a beautiful little angelic candleholder, and a thick, heavy 8′ long piece of artificial pine garland. It’s almost too big to go indoors, so we’re thinking it might make a very nice wreath for the front of the house if we coil it into a big ring. What happened in your day? Today was a shopping day. Not groceries, but gifts. This morning, I took Natalie, Becca and Rachael to Hobby Lobby where they bought some carefully planned gifts for a few lucky individuals. I also picked up part of Bethany’s costume for the church’s Christmas pageant…and I just realized I forgot to get the materials for a backdrop we volunteered to create for the pageant. Guess where I’ll be going tomorrow? Later in the afternoon, I took 5yo Bethany shopping for a gift. Together, she and I came up with a fun gift for the whole family that she could pay for all by herself with just $3-4. She’s working very hard to keep it a secret, so I won’t spoil it by telling here where her sisters might see it. While we were out, we went to a feed store and bought the dog a couple of early Christmas gifts: a duck foot and a pig snout. I confess, I bought both mainly for shock value. I was successful. You should have seen the kids’ faces! It was best $1.89 I’ve spent in a long time! The dog was insanely excited about the duck foot. Have I ever told your our dog can talk? He only says one word: Mom. When he wants something from me, he follows me around just like one of the kids growling, “Ma-ma-ma-moooom!” Don’t believe me? See for yourself. On his way home from work, Perry got a tree. He took a bunch of the kids to work with him today, so they were with him when he stopped to choose it at a local nursery. Just before he snapped the photo below, he told them to look busy. I think each person’s idea of what it means to look busy says a lot about that person. What do you think? After dinner, Perry and I went out on yet another shopping errands. T’is the season, you know. And the tree? We didn’t decorate it, or even bring it in the house yet. It’s sitting outside in the cold cold COLD, waiting to have its trunk trimmed tomorrow, right after we find the saw. 25 Days of Christmas, Day 8: Why Christmas lights? We had a guest preacher today at church, and in his sermon he brought up an interesting point. Why do we use lights to celebrate Christmas? I don’t mean how did it become a tradition, but why? His theory is based on the belief that we are created in God’s image, and tend to mirror his nature in our own actions. We can do this consciously or subconsciously, but it is so deeply ingrained in our nature and our being that we can’t stop ourselves. This is widely accepted as true in many ways: we like to create buildings, art, music, and even procreate because we are mirroring God’s creative nature and works. Our roles as parents mirror God’s loving care for His children. I personally think our storytelling tends to mirror the Gospel, especially in the case of fairy tales, super heroes, and mythology, but also nearly any book or film with a well-written plot. So what does the Bible say about light? Jesus is referred to many times as being light, and the light of the world. To announce the birth of His Son, God hung a great light in the sky, and surrounded it with angels and the light of His glory. He decorated with lights, and so do we! …After listening to the king, they went on their way. And behold, the star that they had seen when it rose went before them until it came to rest over the place where the child was. 10 When they saw the star, they rejoiced exceedingly with great joy. Thank you to everyone who answered about thermostat settings. It sounds like we’re in the right ballpark, and we just need to dress a little more appropriately while we wait to acclimate. That process should finish just about the time it gets warm again. Of course you tend to have that problem when you hit the 80’s in March. But we’re not in the 80’s now. We stayed in the 30’s all day. It feels like winter, even though it’s technically still fall. Today is the seventh day of December. See? I made a trip to the Dollar Tree today, and found something that warmed 12yo Becca’s heart. After hanging most of the lights outside, she really wanted a big bow for the front door. I found one for a dollar. This one even has a jingle bell! I know the knocker says Sanchez. Just go with it, like we do. Tonight as we were setting the table, we realized that all the cloth napkins were in the laundry and we had no paper towels or paper napkins. Then I remembered something else I bought at Dollar Tree today: red napkins with white snowflakes. I thought I would get them out for a nice little touch one evening close to Christmas. It turns out, that evening was much closer to now. Notice the extra guy at the table? Just in case you believed Lydia’s little joke on facebook, he is not her bf (boyfriend). He looks way too much like me. That’s my bro, dude. There’s 25 years between us. He’s actually a year and a half younger than Lydia, and just barely older than our 4th daughter, Megan. Tonight we read Luke chapter 7. As I read each chapter, I am struck by how many titles for Jesus are found right there in a single gospel. 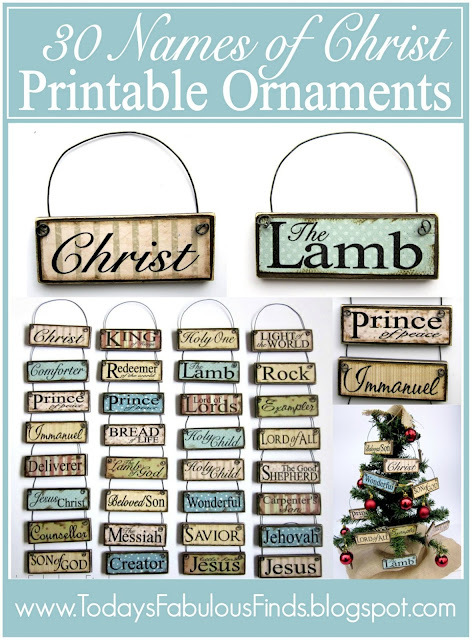 I really want to make ornaments of all the names of Christ. Not sure if that project will happen this year, but it’s definitely going to happen. I really love this version, and it looks very easy. I’m just wondering if there is a cheap way to get scrapbook paper. Do you buy it by the sheet? Oops. Did I say it was finished? It still needs just a few white stitches at the top, and a braided loop for hanging. If I hurry, I can finish tonight! 25 Days of Christmas, Day 6: Baby, it’s cold outside! Today Perry took 6 kids to work, and I took the other 4 to WalMart. I know I said that there’s a basket to hold Santa hats next to the front door, but the truth is they usually get left in the car. Since Perry had a total of 7 passengers, he took the van to work and left the car for me. This time, we got the Santa hats. Uh oh. Do you see what I see? Somebody is NOT wearing a Santa hat. That’s a clear violation of stated regulations. See? Even Calvin wears one. I thought we were going grocery shopping, but when we got to the store I realized that out of over a dozen items on my list, only 2 were food. The rest were Christmas lights, more Santa hats, gloves, tape, etc. A list like this seemed appropriate since we wore our Santa hats into the store. Oh, and weatherstripping. I bought three kinds of weatherstripping, hoping that I could seal up one or more of three very leaky exterior doors, cuz baby, it’s COLD outside and not expected to warm up for several days at least. The good news: the first door I fixed no longer leaks when it’s closed all the way. The bad news: it no longer locks, and barely closes all the way. At least there’s less cold air coming from that direction. Now we need to figure out what to do about the others. By the way, where do you set your thermostat? We try to keep ours at the recommended 68 degrees during the winter, but people keep turning it up. They think they’re being sneaky, but I can usually identify them by their shorts and bare feet. But 68 does feel cold to us; are we just spoiled southerners, or do a lot of people keep theirs higher? Speaking of cold, here’s my favorite version of my favorite Christmas pop-song. I love Christmas hymns, but this song is a little different. I love this version because the couple is married, and the chemistry when they flirt is so very real. They’re adorable! Do you have a favorite Christmas song? Hymn or otherwise? This is one of my favorite of our family’s Christmas traditions: Perry has a rule that anyone who rides in his car between Thanksgiving and Christmas must wear a Santa hat. Keep in mind, we don’t do the “Santa thing.” Our kids know about the real Saint Nicholas, but none of them believe he drives a sleigh pulled by flying reindeer or brings gifts to children. Perry just thinks the hats are a fun way to spread some joy. This basket sits next to the front door. Waving at random strangers and pedestrians is optional, but only a scrooge would decline. And me? I’m never grumpy. If you think this is new, you haven’t been here long. They’ve been wearing Santa hats in the car for years. …and in our diaper. Well, he does. We also have frequent elf sightings this time of year. This elf hasn’t had his morning coffee yet. Last year, there were even some reports of Batman wearing a Santa hat. As you can see, it’s never too late to don your Santa hat. Today we had pumpkin pie for lunch. I couldn’t help it. It just happened. After lunch, we continued our reading of Luke with chapters 3 and 4. The younger kids actually begged me to read the extra chapter today so we could be on schedule. I love it when they are really engaged and interested! Pumpkin pie got me thinking about Thanksgiving dinner, and that reminded me how sad I was that we didn’t get to eat any Thanksgiving leftovers at all. My dear mother-in-law has an obsessive compulsive cooking disorder, and felt compelled to cook us three meals/day, so we never had a chance to indulge in leftovers while we were in Austin. So I did the obvious: I cooked a turkey. I just happened to have a 20-pounder in the fridge. Just for good measure, I did potatoes and sweet potatoes. And corn, and cranberry sauce, because it’s so good with turkey. And stewed apples since it seemed like overkill to make apple pies for dessert after eating two pies at lunch. And gravy, of course. Who would cook a turkey and not make gravy? Do you like my necklace? It was a gift from my 4yo niece. I love the colors and wear it often, but I can’t decide if it looks like I’m wearing a gift from a 4yo, or if I have the fashion sense of a 4yo. Calvin loved helping me with the potatoes. I peeled and chopped, he put them in the pan – or in his mouth. He couldn’t wait to enjoy the fruits of his labor. He’s passing his plate so quickly, it’s a blur. We did just a little more decorating too. Last night Becca and I hung some more lights. We’re not done yet – at least, we hope not. We want 2 more strands to replace the dead spots, and of course we’ll need some for the tree when we get it. This afternoon while I cooked, Becca helped Bethany make an Advent chain. Bethany will tear off one link each day until Christmas. I’m pretty sure we’ll need to make more of these tomorrow for the other young’uns when they see Bethany taking care of business. Natalie and Parker worked on a craft too. Isn’t he cute? Yes, he’s a little dingy. Must be city snow instead of country snow. And I decided this handmade lace doily would be perfect under our little table tree. I got a whole bag of crocheted items like this at a garage sale recently. An elderly couple was clearing out their attic, and the 82 year old man told me his grandmother had made them. He remembered watching her when he was little, and commented that all the wives used to get together and crochet all day back then because they didn’t have televisions to entertain them. His grandmother died when he was still young, so these items are probably 80-100 years old! What’s new in your family today? After a bitterly cold Thanksgiving week, we have enjoyed temps in the 70’s and even 80’s for the last few days. I hear that the cold is coming back, though. I enjoy the warm days but certain people prefer cold weather in December. I prefer not to be cold, ever. I don’t always get my way. And this little guy. The tree, I mean. …which really has hardly any decorations at all right now. I’ll probably let them bring in some ornaments for it with the next wave. It will be used for our church’s ornament exchange later this month, but that’s not a problem. We’ll strip it for the party and redecorate after everyone leaves. Today we read Luke chapter 2, and Megan couldn’t help laughing. Again. She laughed at the same passage when she was practicing her narration part for our church’s upcoming Christmas pageant. There’s a very important comma that sometimes doesn’t get enough emphasis when you read the passage aloud. Just try reading it aloud. Now ask your listeners: Who was lying in the manger? How in the world did all three of them fit in a manger?